Three years after news of her scandalous husband’s death, Adelaide Fiske is at the altar again, her groom a soldier on the Marquis of Wellington’s staff. The prospects seem bright for one of the most notorious women in Kent—until Jane Austen discovers a corpse on the ancient Pilgrim’s Way that runs through her brother Edward’s estate. 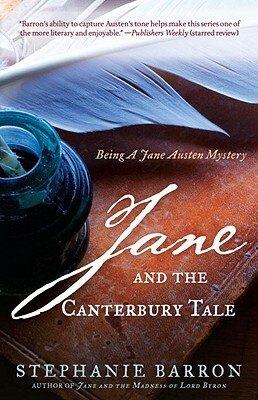 As First Magistrate for Canterbury, Edward is forced to investigate, with Jane as his reluctant assistant. But she rises to the challenge and leaves no stone unturned, discovering mysteries deeper than she could have anticipated. It seems that Adelaide’s previous husband has returned for the new couple’s nuptials—only this time, genuinely, profoundly dead. But when a second corpse appears beside the ancient Pilgrim’s Way, Jane has no choice but to confront a murderer, lest the next corpse be her own. Stephanie Barron’s beloved Being A Jane Austen Mystery series is . . .